If you're nervous about baking a whole fish to perfection, try oven-steaming it in a paper parcel. If you judge the cooking time correctly, you will end up with tender, succulent flesh, delicately scented with your selected stuffing ingredients. In this dish, I've used my five best-beloved ingredients, the heavenly quintet of garlic, lemon, olive oil, salt and butter. this blog snippily informed me that although it's rated 'orange' on the SASSI (Southern African Sustainable Seafood Initiative) database - which means that consumers should use it with caution - it's not actually a sustainable species. Fair enough. But what was I supposed to do with the three lovely fresh kabeljou presented to me by the builder, let's call him Bob, who's doing alterations on my house? (Bob, who is reaching retirement age, has a holiday cottage in Struis Bay, and loves nothing more than to head out of town on a Thursday afternoon to spend the whole weekend fishing off the beach.) Eat them, of course! 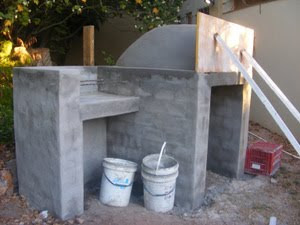 Two have gone into the deep freeze, and I intend to bake them this weekend, when Bob has finished building my new braai [barbeque] and pizza oven. I asked him to do this on impulse, seeing as there were left-over piles of bricks and sand lying around, and a bricklayer on hand. Sure, said the ever-obliging Bob, and when we'd agreed on a price, I showed him what I wanted: a little brick braai with a small adjacent oven. What is rising out of my lawn looks more like the Taj Mahal than the modest structure I envisaged, but I don't have the heart to tell him to scale it down. My husband, who is bewildered by my longing for a pizza oven, has suggested we paint it in a camouflage pattern and turn it into a dog kennel. Anyway, back to the fish: you can stuff whole fish with anything you like, but what I wanted was a powerful lemony flavour, so I used lemon leaves, kafir lime leaves, fresh lemon slices and Vietnamese coriander, which has its own particular lemoniness. During baking, the volatile oils from these lemony things infuse and perfume the flesh of the fish. Some people believe in slashing the flesh of fresh fish, but I don't think this is ever necessary, unless you're cooking a large, oily-fleshed fish directly over hot coals, in which case the slashes help the smoky flavour penetrate the fish, and allow it to cook evenly. The cooking time will depend on the size of your fish. To test whether the fish is done, stick a sharp knife right through the paper into the thickest part of the fish. If the flesh flakes easily, the fish is done. Remember, though, that the fish will continue to cook for two or three minutes after you take it out of the oven, so it's best to underdo it - you can always pop it back in the oven for another few minutes. Preheat the oven to 180°C. 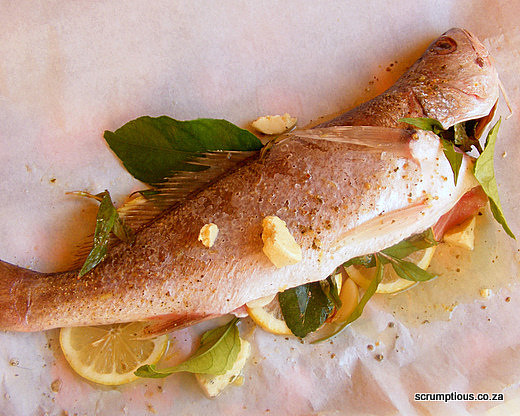 Place the fish on a large piece of parchment paper or greaseproof paper. Season the inside of the fish with a little salt and pepper. Crumple the lemon leaves to release their oil and stuff them into the cavity along with the lemon slices, Vietnamese coriander and garlic. Pour the olive oil over the top of the fish, scatter over the lemon zest and season with more salt and pepper. Cut up the butter and place on top of the fish. Pick up the long sides of the paper, bring them together, and fold over and over to make a neat pleat. Fold in the shorter edges of the paper and tie securely with a piece of kitchen string. Put the parcel on a baking sheet and bake at 180°C for about 25-30 minutes, or until done (see notes above). Using two spatulas, lift the fish onto a warmed platter. Pick up the paper and pour the juices over the fish. Serve with mayonnaise and boiled baby potatoes. This way of cooking is perfect for the smaller fish like the one you got from Bob!!! Can't wait to see what recipes will come from the Taj Mahall!! I have never done "en papillote" (I had to write that, made me feel very French). I think eating the fish was the best choice you could make (not like you could catch and release them). I love your honesty about blogging about it too, there are plenty of people eating "orange fish" and just not telling us in order to stay "PC". If my husband saw that braai he would have some serious envy issues (you know how men like to have the biggest one)and before long I would have the Empire State Building in my back yard! It was extremely interesting for me to read that post. Thank you for it. I like such themes and everything that is connected to them. I would like to read a bit more soon. It was very interesting for me to read that post. Thanx for it. I like such topics and everything that is connected to this matter. I would like to read a bit more on that blog soon. Great post you got here. I'd like to read something more about that topic. The only thing this blog needs is some photos of any gadgets. It is extremely interesting for me to read that blog. Thanks for it. I like such themes and everything connected to them. I would like to read a bit more soon. How about changing it once in a few months?